Last season I decided to try and grow some milkweed to attract Monarch butterflies. We live in a flat, poorly drained area and our septic system is a built up artificial hill that I have transformed in a wild flower area. This will be a perfect location for my milkweed. 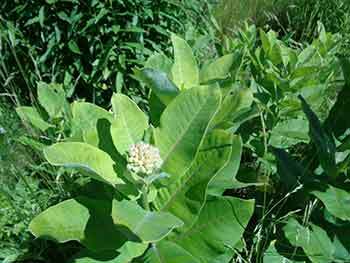 Milkweed grows naturally in the area and I had a few wild plants near a fence. In the early spring I bought a packet of seeds from a local greenhouse and planted them in peat pots. My pool is enclosed in a plastic cover and makes a perfect greenhouse to start my seedlings in the spring. There were not so many seeds in the seed packet so I also planted some seeds that had stayed in a seed pod in my wild plants. 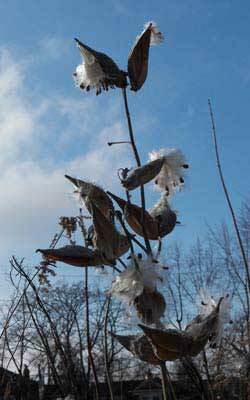 Milkweed seeds have fluffy silky seeds that blow out in the fall. I was lucky to find some in a protected area. 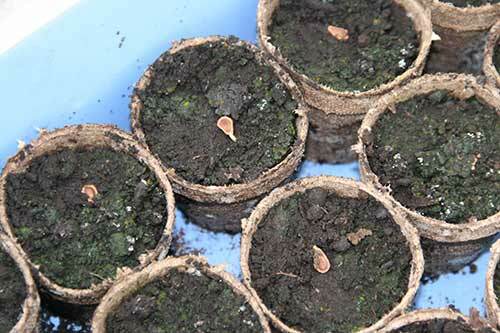 The seeds prefer a period of cold to germinate properly. Since it was too late for me to cold treat my bought seeds I just planted everything and hoped for the best. The ones I collected had stayed out all winter and were plenty cold treated, considering the winter we had. I remember reading about someone who used milkweed fluff to stuff into vest as a cheap and humane alternative to down. I've never tried this. Milkweed seedlings started appearing after about 10 days. Some took almost 3 weeks to come up. Eventually almost all the seeds came up and I did not really see any difference between the bought seeds and the collected seeds. Our spring was brutally cold and nothing came up very fast. The little milkweed plants seemed slower than most. After 8 weeks they were still only a 2-3 inches high. I was afraid to put them out because they seemed frail. Eventually they got planted outside and no one died. I have since read that Milkweed don't like to be transplanted. It was lucky I used peat pots which don't disturb the roots, since they often just get put in the soil as is. I had a hard time keeping them weeded. The plants around them were growing very fast and the milkweeds were slow getting started. They were not promising. There was no difference between the bought seeds and the collected seeds. This surprised me because there are several different varieties of milkweed, I guess both were the same variety. Summer plants are not really very big yet. They are in full sun, with good soil and I've watered them regularly because we've had some really dry weather. They eventually decided to pick up the pace a bit and started to grow faster. This was at the beginning of August already. 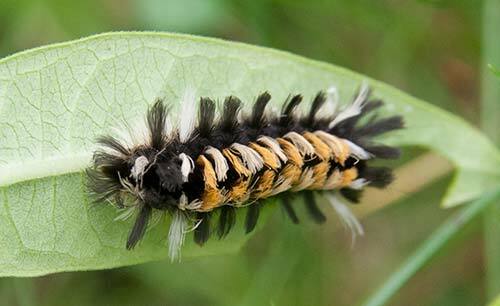 My first client was not a monarch as I had expected but a Milkweed Tussock moth caterpillar, a bristly stiff fella. Various other bugs chewed the milkweed but no sign of monarch yet. I think that maybe I need more flowers to attract the butterflies. 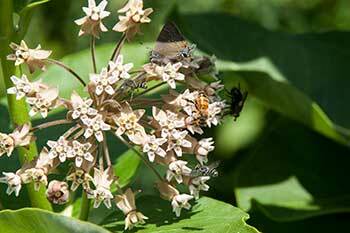 They lay their eggs on milkweed but eat at several different varieties of flowers. Because of the fairly long dry spells I don't think we had as many butterflies as we did in the past. Eventually I found this little monarch caterpillar grazing happily. At first I did not see him, rather I noticed the little round balls of caterpillar poo. I then took a closer look and there he was. After that I had several different batches of monarch caterpillars. They would grow to a fair size and then disappear. They either got eaten by someone, or they went off to make a cocoon. Apparently they can go several meters away. 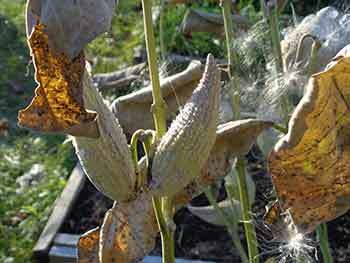 My milkweed never flowered although some in a neighbouring field did. I think the slow start, very cold spring, and very dry summer was quite difficult for many plants. There were not as many flowers as other years either. I planted about 25 plants but the "milkweed patch" was not very large. Next year I will double this number. Much to my surprise I had a caterpillar at the end of September. He made a cocoon called a crysalis but did not hatch until almost the end of October. They usually hatch in about 2 weeks, he took over 4 before he came out. He had survived a couple of frosts and some terrible weather. By that time there were no more flowers except a few hardy clover plants. My butterfly was not very strong and never figured out how to fly. I brought him inside and gave him sugar water, juice, honey, clover flowers and fruit slices. He never figured out how to fly but he walked around and flapped his wings. The week he hatched we had huge winds with gusts of over 100km. He did not have a chance since he did not fly. He lasted about 12 days in his little greenhouse. I think the expected lifespan of a butterfly is only a few weeks. I guess he was laid too late and was stressed by the cold nasty weather. Note: Apparently, late season milkweed is not as nutritious as it should be for monarch butterflies. It's possible that my caterpillar did not get a healthy diet. It's hard to be a monarch. My milkweed came back and the plants are hugely larger and more robust. 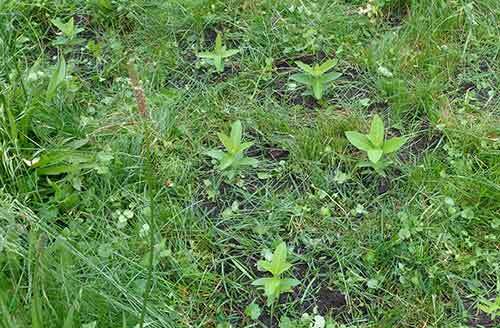 The patch has increased in size and a few plants have started growing outside of the official milkweed patch. I planted a lot more but it's been really dry and I'm not seeing a lot of the new crop coming up. I'm watering the patch when dry. They are all starting to flower. It's the beginning of July. Still no Monarch butterfiles though. I have quite a lot of milkweed flowers in bloom and the big surprise of how popular they are. They are the favourite plants for just about every insect in the garden. The milkweed flowers are covered in honey bees from morning to night but there is constant stream of butterflies, bumble bees, the wonderful wasps that keep my garden free of bugs, plus many unidentified flying objects. The weight of the bees, butterflies and all the other insects on some of the flowers is so heavy that they droop right down. I've now had a few Monarch butterflies checking out the patch and probably laying eggs but I'd not found any yet. Soon the milkweed flowers drop off and become seed pods. 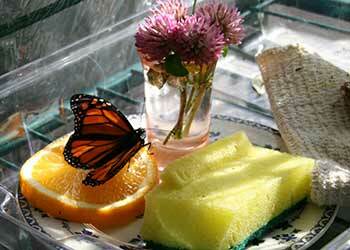 By this time I had collected many monarch eggs and raised several batches of butterflies which got released. In the wild there are only a very small proportion of eggs that get to hatch, and of those that do only a tiny fraction actually become butterflies. This is because there are lots of other insects that patrol the plants looking for tasty eggs, or caterpillars. In the fall the pods dried up and split. This released masses of fluffy seeds that flew all over the place. The seeds need the winter cold to sprout so if you collect seeds for the spring, store them in the fridge or collect them in the spring after they have had their cold period. 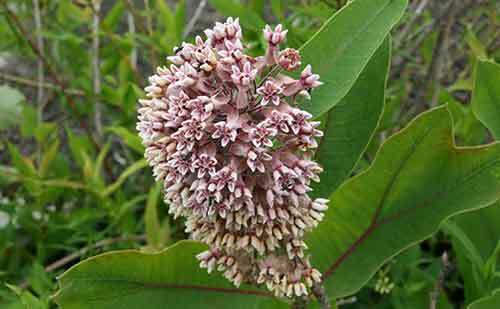 The milkweed plants are said to be poisonous to humans and the sap irritating. It does not seem to have any effect on me but if you grow these plants be careful. 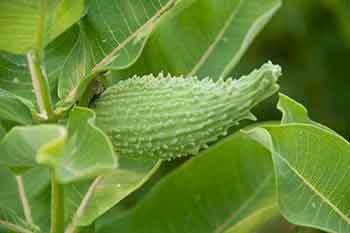 I remember we used to eat milkweed flower and seed pods as well as the young shoots. We boiled them and ate them with butter. I think you need to be careful if you try this. The poison is a glycoside. It does not affect the monarch caterpillars who eat it. Instead, they accumulate it and it stays in the adult butterfly and makes it poisonous to predators. Third year, my milkweed patch is flourishing. I've been collecting and raising monarch eggs and the plants put on a great show of flowers. Not only are there lots of monarchs but just about every other butterfly loves the milkweed flowers. 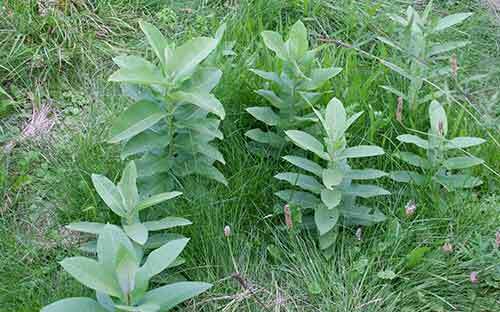 University of Minnesota: Finding, Collecting, and Growing Milkweed. Playgroundequipment has a great page on making a butterfly friendly garden. Great resource with many butterfly articles. Wildflower farm sells seeds if you can't find any plants They are in Coldwater, Ontario. Article on Monarch butterflies from the Notional Wildlife Federation. I have the caterpillars fo Eastern North America and I'm always going to it to figure out who becomes what. 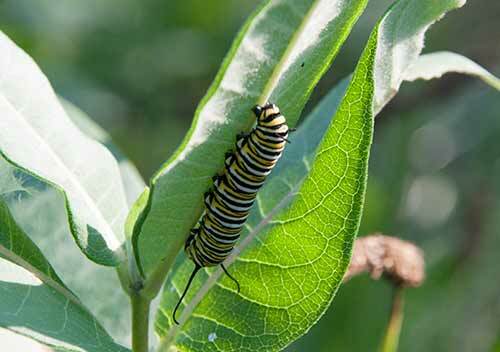 Butterfly Bushes sells Milkweed and Monarch butterflies both larva and eggs, only available in some US states.